So much yarn, so little time. : YAY me! I win again! A wile ago I entered a fiendishly difficult (but great fun!) 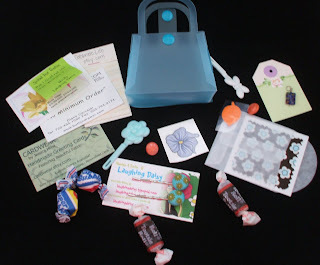 contest on Laughing Daisy's blog. She showed us a picture of her button collection in which she'd hidden some birds - anyway, it brought my competitive nature to the fore and yesterday my prize arrived. I wasn't expecting anything like this much in the package! There are some hairclips made from fabric-covered buttons, another couple of funky plastic hairclips, very retro! a temporary tattoo with which to horrify my grown-up kids, a dear little gift bag, a couple of gift tags, introductions to various new shops ... and some American candies! encourage her to get going on twitter! What a fabulous haul. Yay Nifty!